Scans printed sheet music using the built-in camera and plays it for you. Ever wondered how that interesting-looking piece of sheet music actually sounds? It’s easy with Sheet Music Scanner. Just point your iPhone or iPad at the sheet and let it play the notes for you. You can choose the instrument, pick the speed and enjoy! 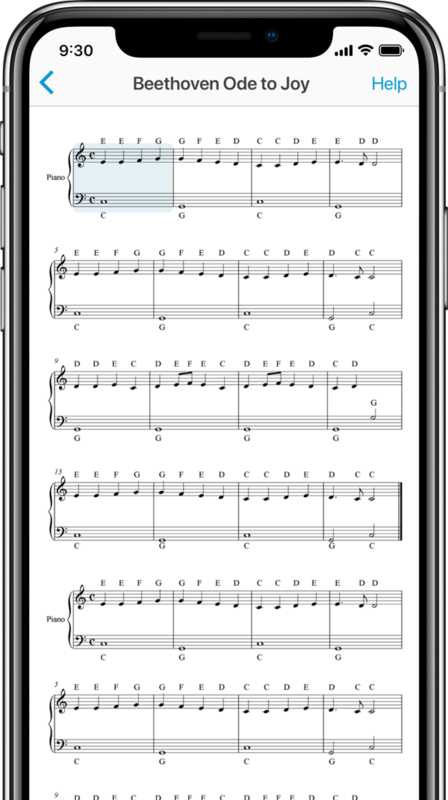 2 for 1 universal iOS app: iPhone / iPod touch and iPad – you can get Sheet Music Scanner for all your iOS devices for the price of one. Launch the Sheet Music Scanner app. Point your device at the sheet and take a picture. Alternatively, browse a PDF or an image file. Choose the instrument, pick the speed and let it play the notes for you. * Note on Export / Import: All major cloud drives supported: iCloud, Dropbox, Google Drive, One Drive. Note that the appropriate cloud drive client app has to be installed for this to work. Reads printed sheet music, not handwritten or mimicking handwriting. The following symbols are not currently supported: repeat signs, codas, triplets / tuplets, percussion notation, dynamics, double sharps, double flats, and grace notes. These are on the to-do list and will come in the future updates. The app currently reads 3 clefs: treble, bass, and alto. Recognition of octave clefs and clef changes in the middle of one staff is on the roadmap – stay tuned! Use high-quality printed sheet music and take photos under good enough light, when scanning from your camera, for optimal results. Some older prints and unusual fonts may not be recognizable. Copyright © 2012 - 2019 David Zemsky. All rights reserverd.